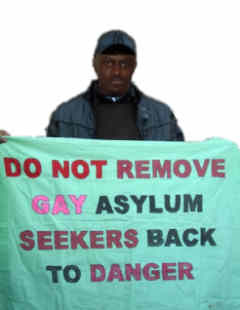 Seven jailed gay men in Cameroon have issued a New Year's message thanking all those who have supported them. 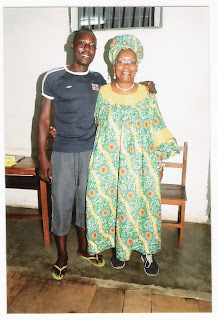 As well, Cameroonian activists have shared a photo of one of those jailed with the lawyer and activist Alice N'Kom. "Although you’ve accompanied us with a lot of sadness, you’ve especially shown us a lot of kindness, love and determination throughout this year. We exhort you to never give up in to the discouragement and to never weaken in your mobilization for us and for the LGBT cause. Because your support represents for LGBT in Cameroon in general and specially for us who are in prison… the HOPE. The HOPE to be one day, released from the PRISON in which we’ve been thrown, but also the HOPE that one day, LGBT people can walk quite freely in Cameroon, without any humiliation. We wish you, from the bottom of our heart, to be of happy, healthy and that the coming year be full of promises and success. As F Young reported here last month, Cameroon is extending anti-gay laws and, according to N'Kom, doing this quietly to try to avoid international attention - a clear sign that international focus on Cameroon's repression of gay people is having an impact. At least 10 men have been arrested and imprisoned for homosexuality in Cameroon so far this year, not only for what they allegedly did, but for who they are, or even appeared to be. In November, ADEFHO and other groups announced that there is a government-organized campaign run by youth brigades to entrap gay men on the Internet. Sign and share this petition to Cameroon's President.